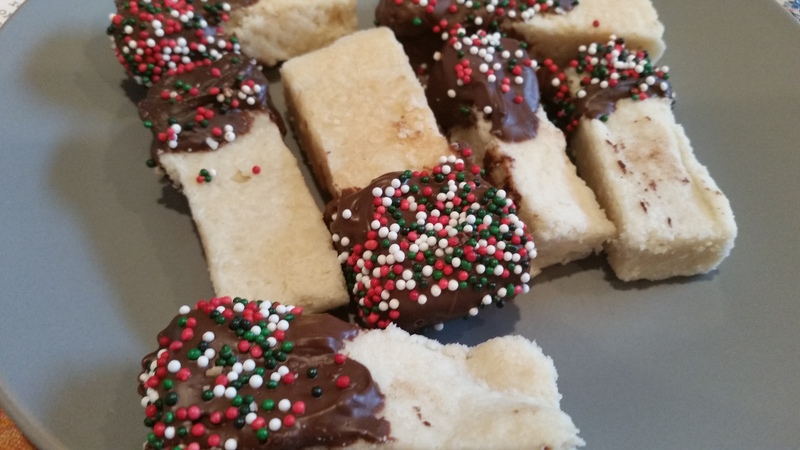 Chocolate Dipped Shortbread Cookies – What's for Dinner Moms? ‘Tis the season! Cookies, cookies, and more cookies! Today is a perfect day for us to stay in and bake cookies. We have a nice fluffy 3″ of snow on the ground and are expecting at least 6″ during the day. Beautiful day to stay in and watch it snow while we bake. I am always looking for cookies that are easy to make, taste good, and look great. These cover all three. My daughter made the cookies early one day and later in the evening we dipped them in chocolate. Add sprinkles, nuts, or crushed candy to decorate as you wish. These were super simple to make and decorate. They have a moist texture that was not dry at all. Store the cookies layered with wax paper in a sealed container for us to 5 days. Tip: Cut the cookies before you bake them. They will be easier to cut later into sticks and tend to not break as easily. The cookies are a bit fragile so do NOT make them too thin. You want them about 1/2 to 3/4 inch thick. They may not fill your whole rimmed baking sheet but that is okay. You can cut the ends to square them up. Preheat oven to 350 degrees. Prepare a rimmed edge baking sheet at least 11″ x 15″ with non-stick spray or parchment paper. You can use a 13″ x 9″ pan but cookies will be thicker. Cream together butter and sugar until light and fluffy. Add vanilla and flour and blend together until well mixed. Press the dough into the prepared pan until evenly spread. 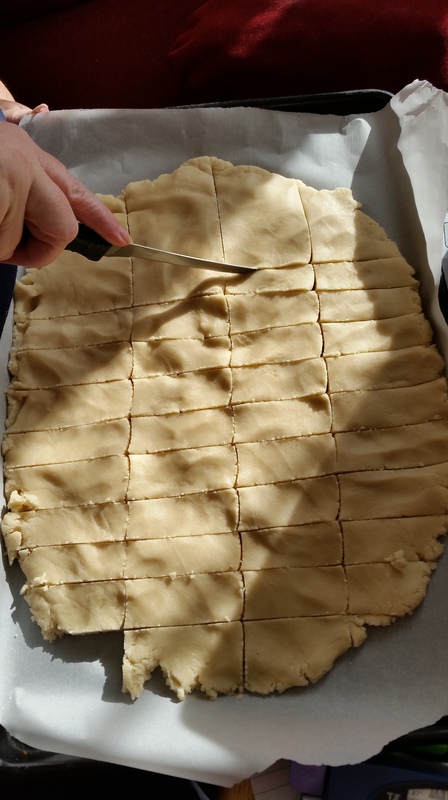 Using a sharp knife cut the cookies into bars. Bake for 12-16 minutes (depending on thickness). Cookies will NOT be browned on top use toothpick to test if done. Remove pan from oven and re-cut with sharp knife on original lines if needed. Allow cookies to cool for at least 30 minutes before removing from pan. To dip cookies place chocolate chips in a microwave safe bowl and microwave until chocolate has melted. Melt in 30 second intervals stirring between melting times. Carefully dip cookies in chocolate and then place on parchment or wax paper to dry. If you wish to add sprinkles, nuts, or candy as toppings sprinkle them on before the chocolate sets and slightly press into chocolate to secure. Store in sealed container up to 5 days. Very nice. I could make these and take them to the small grandkids to do the dipping. They might be better at these than trying to decorate cut-out cookies. Dipping is easy. They are a bit delicate. Oh my gosh, these look so yummy, a can’t wait to try them. Thanks for sharing. This post is for my Mom who left us much too early. What is cool about this recipe is that it is from a great Mom who cooks and bakes for her beautiful family! I think that’s fitting soooooooo, What’s For Dinner Moms?! My Mom made me shortbread cookies every Christmas! She always found a pretty round tin container with a decorative lid. She would line it with wax paper and put layers of giant round shortbread cookies that she scored to look like pieces of pie. Now, if you knew my Mom you would know how HUGE that was! She COULD cook and bake BUT she really didn’t like to. Complete opposite of me! She made those cookies for me only because she knew just how much I loved them! Thanks Mom! I don’t have her recipe so I thought that another Mom’s recipe would be just as great! I mean, have you seen how beautiful they look? I think crushed candy canes would look super festive! Thank you, Lisa. Those memories that your mom created for you are the same memories I want my children to have. I too am not a baker but at this time of year I look forward to it. I want my children to one day make cookies for their kids and tell them about how I rarely baked but at Christmas there were always special treats. Hope you have a wonderful holiday! These cookies look so Christmassy and yummy, Marci.